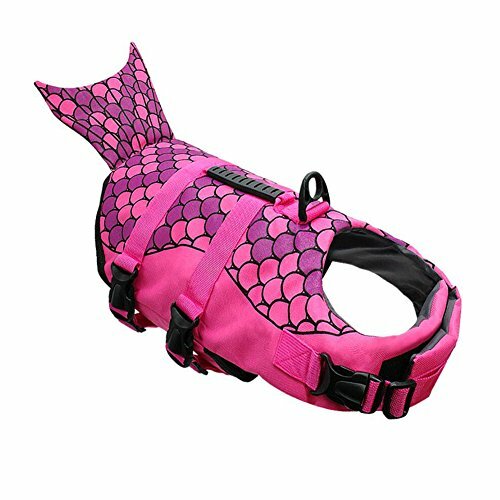 Cute Design Dog Life Jacket, Ripstop Adjustable Pet Safety Swimsuit for Dog Safe Swimming. 1, Unique shark and mermaid design make your dog more cute and lovely. 2, Use ripstop and durable material, and really lightweight. 3, Thick foam in the life jacket, make it float well. Keep your dog safe in the water. D ring for leash. 4, Easy-grab rubble handle on the top, help ensure your pup safe while swimming. 5, Adjustable velcro and nylon straps fastening system, with quick release buckle ensure the perfect comfortable fit for your dog. 6, The quick release buckles is easy to quick on and off. Size Small: Back Length 11.8"(30cm) Chest Girth 12.6"- 21.3" (32-54cm) Neck Girth 11.4"-13.8"(29-35cm); Recommended Weight 8.8lb- 19.8lb (4-9kg). Size Medium: Back Length 13.8"(35cm) Chest Girth 17.3" - 25.2"(44-64cm) Neck Girth 13.4"-19.7" (34-50cm); Recommended Weight 15.4lb- 26.5lb (7-12kg). Size Large: Back Length 17.3"(44cm) Chest Girth 27.2"-31.5"(69-80cm) Neck Girth 20.9"-24.8"(53-63cm); Recommended Weight 41.9lb-77.2lb(19-35kg). Please choose the suitable size for your beloved dog. Because of different measuring methods, please allow slight measurement (1-3cm) deviation for the data. Since the different computer monitors, the color maybe different with the item, specific please in kind prevail. Thanks. PREMIUM QUALITY - Made of high quality 602D Oxford polyester material and polyethylene foam. Extremely Durable, Thick, and Lightweight. PORTABLE RUBBER HANDLE - Convenient top handle makes it easy to move around with your dog. Also, easy to put on and take off when putting into or aiding leaving water. The Heavy-duty D-ring Hook is perfect for dog. FREELY TO ADJUST THE TIGHTNESS - Adjustable nylon straps, quick release buckles, heavy duty yet more comfortable velcro fastening system around the belly and neck to keep securely fastened. MORE SIZE FOR YOU CHOOSE - SMALL: jacket length 11.8", chest 12" - 21", for dog weight 13 - 19 lbs; MEDIUM: jacket length 13.7", chest 17" - 25", for dog weight 19 - 26 lbs; Large: jacket length 17", chest 27" - 31", for dog weight 48 - 79 lbs. Please choose the right size for your baby dog. 102% MONEY BACK GUARANTEED - Your satisfaction is our final goal.If for any reason you are not satisfied at our lunch container, return within anytime and you will receive a full refund or replacement immediately! If you have any questions about this product by G LAKE, contact us by completing and submitting the form below. If you are looking for a specif part number, please include it with your message.